Pets are pretty special aren’t they? Unless you have or have had a pet I don’t think you can truly understand the way they become part of a family, gelling everyone together and putting a smile on your face everyday. I always had a pet growing up. First came our fluffy rabbits (affectionately named Mopsy and Thumper by my sister and I), then there was the hamster that used to keep me up all night running laps on his wheel, and we were never without a family dog. But until Sam and I got Lola, I’d never had a cat before. I’ll admit that I never really thought I liked them and definitely never imagined I’d have one as a pet. But when we saw the advert asking people to rehome some abandoned kittens, something changed within me and I was suddenly begging Sam to let us bring one home. Thankfully he agreed, and now we are both completely smitten with our feline friend. One of the things that put me off ever getting a cat was that I thought they didn’t have much personality, but Lola has well and truly changed my opinion on that front! She is full of sass and affection, and she puts a huge smile on our face every single day. In fact, most days she has us laughing our heads off at the funny noises she makes, or chuckling about the fact that she seems to find the bathroom sink more comfortable than her luxury cat bed. She has become a huge part of our life and daily routine, and I can’t imagine not seeing her waiting in the window sill when I get home, or having our family cuddle every morning. She makes every day better, and for that reason, we like to take good care of her and make sure her days are filled with plenty of little treats. One way we treat Lola is by making sure she gets lots of playtime every day. Lola is a housecat so needs a little bit more entertaining than some pets, and we carve out a good chunk of time every evening for playtime and fun. She has lots of specific cat toys, but we find that she prefers to chase after Sam’s guitar strings, or play peekaboo behind the bannister. Of course we squeeze in plenty of cuddles and tickles too. Lola is quite demanding and will let you know when she’s ready for her daily head rub - usually she just plonks herself down on your lap and stares at you longingly until you give her a good scratch behind the ears. I have to admit that this is always one of my favourite parts of the day - she makes the cutest little noise when she’s getting a tickle! And for special occasions, we treat her with food - just like her humans, it’s one of her favourite ways to indulge and celebrate! Lola has dry food most of the time to help us keep a track of her diet, but we do give her a little treat every now and then. 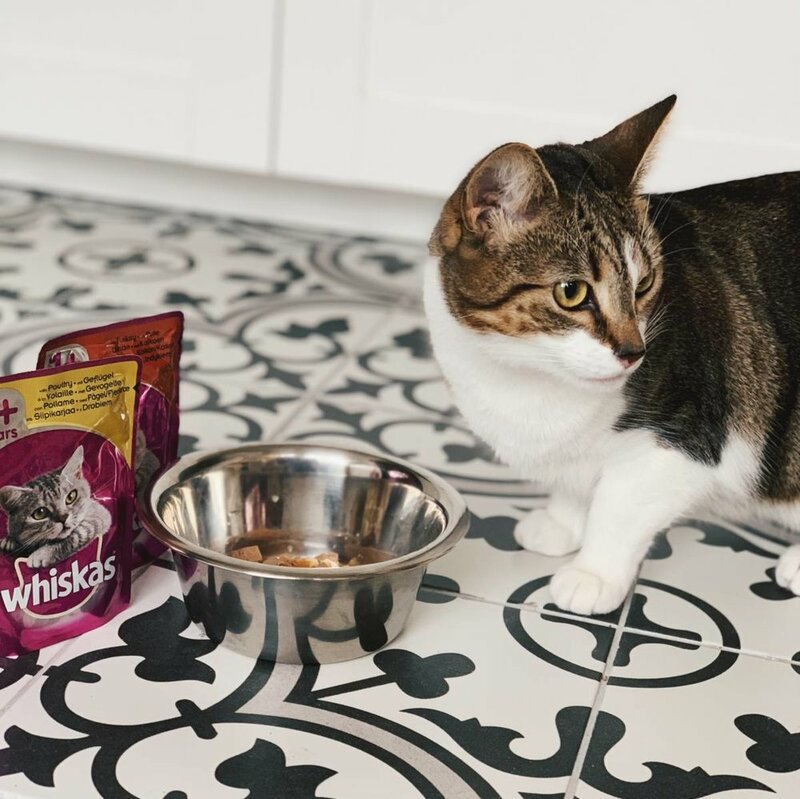 This week she tried the Whiskas cat casseroles and they were an absolute hit - she was licking her lips for a good half an hour afterwards. Plus, as they’re made with only the best quality ingredients, we could relax knowing that they’d help to keep her both happy and healthy. This little furry creature is definitely the apple of our eye, and it's safe to say we're well and truly wrapped around her finger! Do you have a pet? How do you like to treat and reward them?